Correct reproduction of the firewall carpet guard fasteners. These fasteners are required to allow the firewall guard to attach properly to the firewall. Two required per vehicle. Screw for mounting carpet guard to firewall. Includes correct wax thread sealant to prevent firewall water leaks. 2 piece screw kit. 1.5" long screw with 1" dia washer. Reproduction door sill plates for use on all 1967-69 Camaro and Firebird models. These reproductions are exactly like the originals and include riveted Fisher Body emblems. 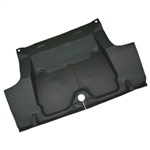 Injection molded reproduction of the carpet firewall guard used on all 1967-69 Camaro and Firebird models. Mounts to the firewall below the steering column. Replacement of this item is recommended whenever installing new carpet. 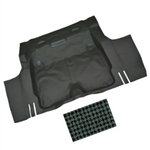 Quality replacement carpet underlay for 1967-69 Camaro and Firebird models used to eliminate noise and add padded comfort on floor carpet. 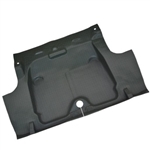 Helps protect floor pans from rust and acts as a barrier against outside heat, cold and noise. 1967 Camaro Firebird Trunk Mat, TM Vinyl. Aqua houndstooth. Replaces factory original. 1968 Camaro Firebird Trunk Mat, TM Vinyl. Aqua houndstooth. Replaces factory original. 1969 Camaro Firebird Trunk Mat, TM Vinyl. Houndstooth. Replaces factory original. Excellent quality reproduction of the original carpet that is produced to the exact dimensions of the floor pan. Manufactured in two sections (front/rear) as original. They are not pre-cut with any openings in the carpet due to variations in factory interior options such as bucket or bench seats, console or non-console, or floor shift, etc. Each set includes the correct color matched binding attached to the rear edge of the front carpet which overlaps the rear carpet. Also includes a correct color-keyed reproduction of the original heel pad. Comes complete with original style 36 oz. jute padding attached to the underside of the carpet. Every carpet is produced with original type 80%-20% rayon and nylon blend loop carpet. Note: We stock only Black and all other colors are drop shipped and can take up to two weeks for delivery. Special order carpets are non-returnable. Please be sure on your color before ordering.